It is no secret that health is instrumental to an individual’s education, income and overall development. Studies show this is true for countries as well; health can be a causative factor for the aggregate economic growth of a country. The World Health Organization has estimated that a 10-year increase in average life expectancy at birth is associated with a rise in economic growth of some 0.3-0.4% a year. This evidence is available at the micro-disease level as well: for example, a 10% decrease in malaria is associated with an increased annual economic growth of 0.3%. A case in point are Asian countries such as China, Malaysia, South Korea and Thailand. Plotting their economic growth vis-à-vis two key health indicators reveals an astounding fact: They have succeeded in improving health as well as delivering sustained economic growth. Data over decades reveals that health improvements, illustrated through the infant mortality rate and life expectancy, actually preceded their economic surge. 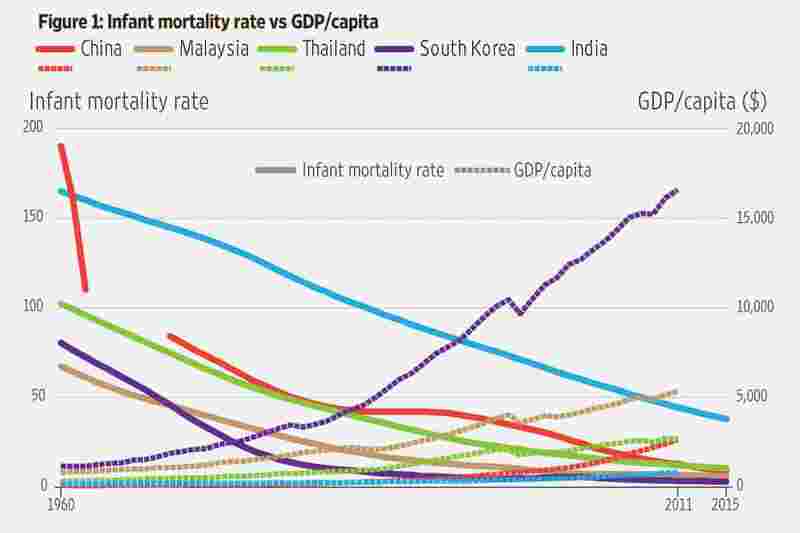 This is illustrated most dramatically in China, where both infant mortality and life expectancy improved dramatically in the 1960s, before the surge in Chinese economic performance (see Figures 1 and 2). In other words, countries become healthy before they become wealthy. As a nation, we too have made good progress, and India is healthier today than ever before. We have eradicated small pox and polio; made progress with regards to HIV infection and Aids-related deaths and seen increased access and affordability. 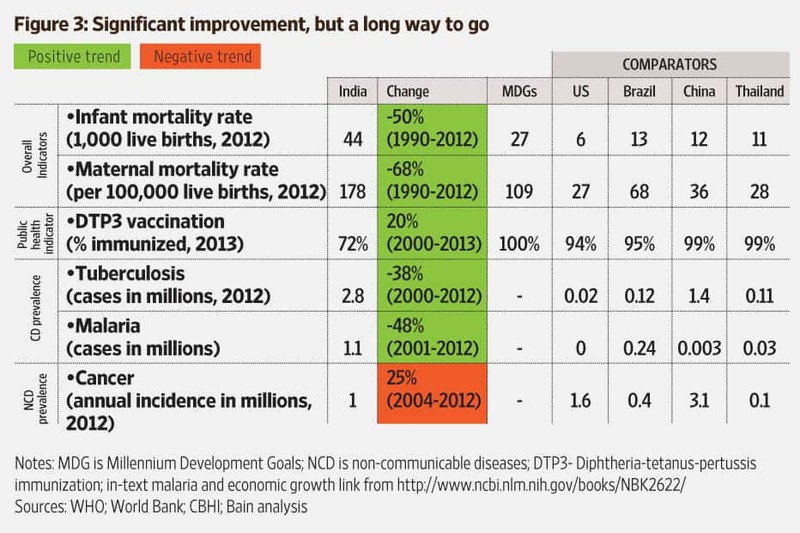 However, a lot still remains to be done, especially when compared against the Millennium Development Goals (see Figure 3). India continues to grapple with highly prevalent communicable diseases even as it faces an onslaught of non-communicable diseases (NCDs), fuelled by rapid urbanization. By 2030, NCDs will cost India a whopping $6.2 trillion (estimate from a discussion paper of the Institute for the Study of Labor, 2013). Despite these threats, overall spending on healthcare, particularly public spending, is very low. India’s health systems, with huge gaps in delivery infrastructure as well as skilled professionals, are completely unprepared for dealing with this twin challenge (see Figure 4). In essence, we are still not a healthy country and our lack of investment in the health system will come in the way of our continued economic development. A direct consequence of a nation’s poor health on its economy is through the adverse impact on its human capital. Studies have demonstrated a strong case for improvements in health and nutrition, concluding that health capital contributes more to wealth than other dimensions. 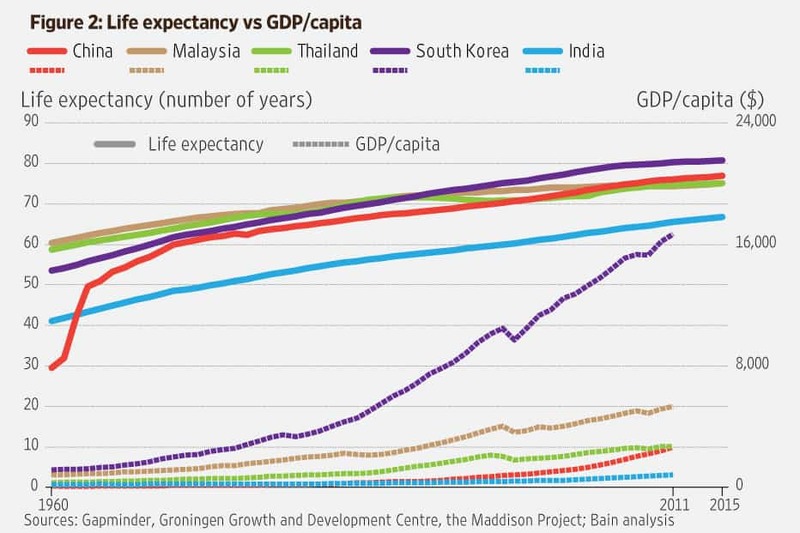 In South Asia, according to Global Health 2035, a Lancet Commissions report, the annual value of mortality change for 2000-11 was equivalent to nearly 3% of average income during that period, which was almost half as large as the value of the increase in GDP. It is a healthy nation that turns into a wealthy nation. India is unprepared for the dual burden of communicable and non-communicable diseases. Yet, there is clear proof of the returns from investing in healthcare—the soft infrastructure of a country. 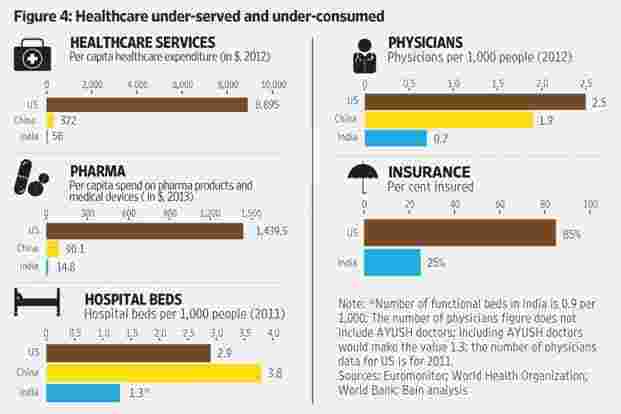 As the nation and the government look at a second wave of reforms, healthcare needs to be a key priority. We can bring about a tectonic shift towards better healthcare within a decade, if we act quickly. Our aspiration should be for a healthy India, where citizens are health-aware and engaged, have equitable access to affordable health coverage with a focus on prevention, early diagnosis and assured minimum quality of care, offered by a vibrant and sustainable ecosystem of public and private players. Bain estimates that realizing these healthcare aspirations by 2025 will require a cumulative $3 trillion in spending, including about $600 billion in capex. Given the size of the challenge, the government has to enable greater funding from public and private sources, private insurance and individual contributions. It should assign higher priority to healthcare in budgetary allocations, explore all avenues for fund-raising and aim to ensure better management of healthcare spending across different stakeholders. The public sector cannot deliver on the agenda alone. Private-sector players bring entrepreneurship, innovation and an ability to deliver financial and medical outcomes that create a sustainable ecosystem. The urgent and immediate agenda is for all stakeholders—public and private—to acknowledge the task at hand and work collaboratively to address them. Karan Singh is the managing director of Bain and Co., India, and leads the firm’s Asia-Pacific healthcare practice from New Delhi. Parijat Ghosh, based in Mumbai, is a partner and leads Bain’s healthcare practice in India. Next week: Myth of the dumb Indian farmer—agriculture, the missing story.